"The game plays fantastic on the Nintendo Switch!" DotEmu has confirmed that Wonder Boy: The Dragon's Trap is coming to the Nintendo Switch in 2017. A remake of the Master System classic, The Dragon's Trap boasts lush HD visuals and a revised soundtrack. It's not yet known if this fresh announcement impacts the proposed Wii U eShop version of the game, but we've approached the developer for clarification and will update this post if we hear back. 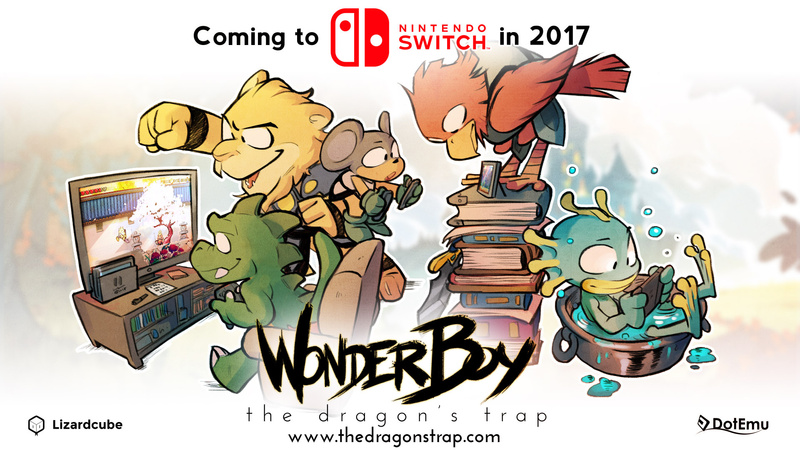 Wonder Boy: The Dragon's Trap is coming to the Nintendo Switch™ in 2017! A reunion was held in mushroom kingdom under a veil of absolute secrecy, where Nintendo suggested we could bring the game over to their upcoming platform. Needless to say it was a unique opportunity and as soon as we saw the system we knew we wanted to get the game on it. We started working on it and well, HERE WE ARE! The game plays fantastic on the Nintendo Switch! It runs at a smooth 60 FPS, the screen and colors in handheld mode are amazing, and it plays just as well in full HD when docked. We can't wait to show you more! If you don't plan to dock yourself on the Switch bandwagon just yet, rest assured, the game will also be coming to other platforms! We will announce them as well as the game release date as soon as we are ready… and we've got a bunch of other cool news coming. It's great to see that this classic Sega title is coming to Switch. How do you feel about this news? Let us know with a comment. Not familiar with this one but it looks fun. Wait a sec, shouldn't this be a SEGA IP? Really excited for this game! Being on the Switch is great, it is exactly the type of game I can see fitting perfectly to the platform. Yay! I loved Dragon's Curse on TG-16, can't wait to get this. Wait.. Wonder Boy? Is this a game featuring Tenacious D? If it is I certainly hope I get to "fill the crevasse with my mighty juice"! Looks kinda 'mobile/flash'-lite in its graphics, but at the same time, I'm digging those character models and the art style. I am so bloody stoked! I love this game so much I'm completely ready to pay for it again, despite the fact that a Sega MasterSystem with the original version sitting in it is withing ten feet of me right now. Awesome, I'm glad to see this coming for the Switch as well. Looking forward to this one since it was announced. If it is coming to Switch, now there's where I'm going to get it. Well that was a much better announcement read than that other one about sitting on the toilet and flushing. Never heard of it. Looks cool. Looking forward to a review on NL! Very unique Flash game style but i'm not interested with the character design. I'm intrigued. I'll wait for more, but, it's always good to see Indie games come to the Switch. NO WAY! I loved the original, I've actually still got my Master System with Wonderboy Built in, and my Commodore 64 version on Tape. But why have they made him a lion? May not be a system seller, but the more games the better. Will look at and consider once it's released on the Switch. Finding myself leaning more towards simpler more retro like 2D games; which makes the lack of a Joycon d-pad all the more unfortunate. Looks great fun, I love the art style! Looks cute. If it reviews well, I'll probably pick it up. Last I seen of this it was meant to come out on the Wii U. That probably won't happen now. I'm sold I will totally get this. It has a Shantae vibe. I also have the Wii won and was pleasantly surprised great game. @FX102A agreed. The lack of a d-pad will have a negative input on games such as this, USFII and any retro Virtual Console games in the pipeline. The Master System version is a classic. This should be good. I never even heard of Wonder Boy before, but after seeing this I almost need it. I am a sucker for classic platformers. Please don't refer to all 2D games as Flash games. Possibly with a few new additions, but they haven't been discussed yet. @AlexSora89 Either Sega relinquished the rights or it's being licensed like Shenmue III. This is a remake of a game that heavily inspired Shantae. Just got into this series playing Wonder Boy in Monster World (originally on Sega Genesis) on Steam. It's a fun little game. @Bunkerneath I thought there was a lion form in the original. And the PC Engine version had a tiger form instead, I think. But I could be mixed up or something. YES! Maybe this sounds odd but this is kinda my killer app. I preordered a Switch already but this is just more evidence that was a good decision. Sweet. Will check it out come release day! Did not know that and i will try the game . Also is their any news of Half Genie Hero coming to the switch? @DanteSolablood Staaaaahp it with the references, Dante! Staaaahp it! @AlexSora89 Wonder Boy has an interesting history... The character is Sega's, but the the games' contents aren't necessarily owned by Sega exclusively. Nothing's been confirmed yet as far as I know. @PlywoodStick This isn't the greatest reference in the World, this is just a tribute. Yeah. You know this is going to inspire some mouth-breathing Eagleland resident to bring along their NS in the bath and then sue the Big N after they accidentally drop it thanks to their slippery processed cheese-covered fingers. Hope so and to be honest i am expecting that we get one soon. I never played the Master System, I had an NES & C64, so I'm not familiar with any of the Wonder Boy games, but the excitement on here is tangible! I hope it's as good as everyone hopes! I also hope the same is true for the other two related projects that are floating around (Monster Boy and Wonder Boy Returns). I played a ton of the Wonder Boy series when I was a kid (on a preloaded flash kart I purchased in LA no less). Going for a 2-D animated style suits the game's atmosphere. I'll definitely be picking this up for the Switch! Looks great! That would be a great game to sneak into the early launch window. I'll be darned if this doesn't look utterly fantastic! Glad to see, given how excellent the sidescroller offerings on Wii U were, that the style hasn't been abandoned on the Switch. So stoked for this. One of the best games ever! Very happy this is coming! Can't wait to play it. Either way, I'm truly puzzled. It's kind of a legal minefield as far as I can tell. I likey. I'll be adding this to my backlog for sure. @AlexSora89 Sega was publisher only back in the day far as I read. Which is strange when you consider the wonder boy titles made it to the Wii VC Sevice from Sega...but that was almost 10 years ago so maybe whatever rights they had as a publisher has expired now. @Agent721 master system was a great console just a small library cause no 3rd party support (locked up by Nintendo for the nes) but it has many amazing games that hold up very well today. I barely touched my C64 after I got me some Sega! Ha! I can understand that, the C64 was very cool, but the console games were way better. Once I got an NES, I did the same. I played the Genesis, but never touched the Master System. I'll look forward to this release...cheers! My favourite Master System game, i've been stoked for this for quite a while now. Awesomeness. I always felt Nintendo should be the kind of place to enjoy classics, reborn or otherwise. Wow. This looks stunning. I should get it. Is it wrong that after Zelda this and Monster Boy are the two games I'm most hyped for? Wonder Boy in Monster Land was my first console game and I love it. Wonder Boy III is up there with Ocarina as one of my favourite games of all time. I don't know whether to shiver or to rejoice. Should I shiver at Wonder Boy's license being once in the powerful hands of SEGA (I know that's not exactly the case, but it sort of is)? Or should I rejoice at Wonder Boy's license now being in a minor studio's hands, as those studios - such as Yacht Club Games - are the ones that usually care the most? @AlexSora89 I can elaborate upon the two potential situations. Relinquishing rights basically means that Sega no longer has the rights to Wonderboy (like they no longer have the rights to Rez). Licensing on the other means that, they still own the Intellectual Property, but it's the developers that are making the majority of the profit out of the game (like Fear Effect Sedna). Interesting to know. Man, copyrights are fun. If headaches are your idea of fun, that is. @AlexSora89 Sometimes, copyrights work out for the better. Just look at Double Dragon and River City Ransom. Because Arc System Works owns the rights to those franchises, they can survive outside of a defunct company. Any franchise is in good hands with Arc System Works.